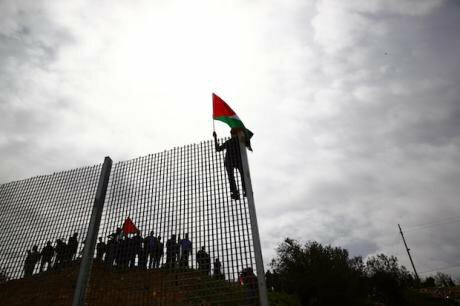 Palestinian protesters take part in a protest to mark the Land Day in the West Bank town of Beit Jala near Bethlehem, March 30, 2017. Picture by Xinhua/SIPA USA/PA Images. All rights reserved.The past few years have proved vital to the Palestinian national discourse. Beyond rigid theoretical themes and historical-ideological frameworks, a mixture of contemporary political and economic developments are aggressively shaping a more pragmatic bottom-up national identity. These factors are giving rise to a narrative based on decentralized identity preservation and localized nonviolent resistance. The 1993 Oslo Accords established the Palestinian Authority (PA) which has dominated the national Palestinian discourse since. The PA’s state building project promised Palestinians a national statehood on the 1967 borders of the West Bank, the Gaza Strip, and East Jerusalem. The PA has established government-like institutions operating under the tight control of the Israeli military in all major city centers in the West Bank and Gaza. Furthermore, the World Bank and various other international organizations declared the PA institutions ready for statehood by 2011. However, a dichotomy between the PA and the political and economic realities on the ground has eclipsed its achievements. This dichotomy is best characterised by institutionalized fragmentation and Israel’s accelerating colonisation. The Oslo Accords divided the West Bank into three administrative divisions; Area A, B, and C. Areas A and B, which represent 39 percent of the West Bank, were to fall under the responsibility of the PA at various levels of civil administration and internal security. Area C, however, which represents 61 percent of the West Bank, was to remain under full Israeli control until a final settlement is reached. This area consists of more than 250 Israeli settlements and outposts, most agricultural lands, all major roads in the West Bank, and all Israeli Army declared strategic areas. For ordinary Palestinians, the Oslo accords demarcated their lands and institutionally confined their economic and social activities to a portion of the West Bank for the first time since 1967. Area C represents the cornerstone on which any viable Palestinian state could operate. It contains the majority of agricultural lands in the West Bank, natural resources, water, and borders to the outside world. The World Bank and other international institutions repeatedly reaffirmed that without the Palestinians’ ability to develop and access Area C, the foundational economic resources for a functioning Palestinian state simply do not exist. While the issue of Area C may seem superficial, it dictates the everyday lives of Palestinians. A few hundred meters away from the PA’s presidential compound in Ramallah lies the Israeli unit for the coordination of activities in the occupied territories (COGAT) in Beit El Settlement. The COGAT is the de facto supreme authority in the West Bank. Since all major roads and border crossing are in Area C, the Israeli government controls most intercity economic activity and travel. The PA is also contingent to this regime, all PA officials have to obtain permits for intercity and international travel and operations from the COGAT. Theorising about realities on the ground in the West Bank often leads to academic and policy works focused on the quasi-sovereign nature of the PA. However, the effect of these practices is reflected on the collective consciousness of Palestinians. Israeli settlement activity is no longer a headline in newspapers, it is quantifiable and protrudes on most of the hilltops across the West Bank. In 1990, there were around 200,000 Israeli settlers living in the West Bank and East Jerusalem, by 2015 this number has exceeded 650,000 living in more than 250 settlements and outposts. Israel’s colonization of the West Bank extends to economic and natural resources, too. For example, an Israeli settler’s household in the West Bank consumes on average 4.5 times more water than a Palestinian household. Moreover, Israeli businesses have licenses to quarry stones from the West Bank hills, and extract minerals from the Dead Sea area further depleting Palestinian natural resources. On the other side of the Palestinian equation lies the Gaza Strip where decades of Israeli occupation, colonization, and blockade have rendered it nearly unlivable. Gaza has faced a systematic de-development campaign stripping it from its human, financial, and physical capacity and capital. The costs associated with Gaza’s blockade further compound the ‘fragmentation’ narrative in contemporary discourse. The PA, Hamas, Egyptian, and Israeli behaviors have incentivized the creation of an isolated reality in Gaza. One that is economically inferior, socially embittered, and institutionally distinct to what exists elsewhere in Palestine. In light of these policies of fragmentation and colonization, the PA stands helpless. This has motivated the decentralization of the national discourse from the PA (or other centralized political factions) into localized acts of identity preservation. For instance, recent events in the Al-Aqsa Mosque compound reflect the rise of a localized narrative that is not affiliated to institutionalised political movements among Jerusalemites. Another example is the evolution of a localized culture of nonviolent resistance across several communities in the West Bank in face of land confiscation and settler violence. Most notable are the communities of Kafr Qaddum, Nabi Salih, Bil’in, and Susya; where their struggle for identity preservation has been shaped by weekly nonviolent protests, international solidarity campaigns, and a distinctive locally evolving culture exemplified by art and poetry. Recent developments on the ground in Palestine are creating a localized Palestinian national discourse intrinsically constitutive of the larger Palestinian national identity, but unique in its political, social, and economic contexts. A national identity that is based on preservation by addressing immediate threats in a decentralized and locally customized narrative distinct from that of the central political factions who traditionally dominate the national discourse.